Beginning on Friday, August 3rd LA Beer Hop will be doing tours of the DTLA breweries during happy hour. Every Friday night from 5pm-8:30pm we will be touring the breweries around Downtown Los Angeles. Beer tastings included. Fun included. Beautiful sunset pending availability. The tour visits three breweries and includes a flight of beer at each place, bottled water, and as much beer info as you like. The entire event takes about four to five hours and the ticket is $69/person. Dinner will be available during each tour. Tickets available online and are limited to 15 seats per Friday. LA Beer Hop is also available for private and corporate tours on any Friday. 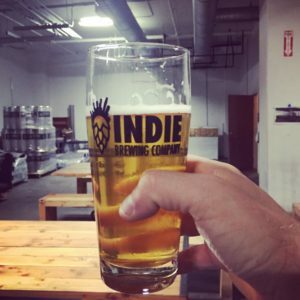 You may have seen their beer on shelves, you may have even tasted it, but when you visit their taproom, that’s when you really get to know Indie Brewing Company. Because to know Indie is to know the four guys who run the place: Kevin, James, Morgan and Connor. They’re the brewers, taproom attendants, salesmen, interior designers, tap-handle fabricators, and janitors for this new brewery in DTLA. It’s technically Boyle Heights, but you could easily say that their taproom is in Downtown LA or even The Arts District. The building, which they share with a handful of apparel companies, is located just off E. 7th Street conveniently close to Iron Triangle Brewing. In fact, while we may not recommend doing it alone, a brisk walk from one brewery to the next wouldn’t be the worst idea. The interior of the space feels like it was curated by four guys who work in beer for a living. Hand-made picnic tables, jockey boxes, beer cans, corn hole and a couple of futons. Imagine the cleanest version of a frat house with the best beer selection. Your beer will be poured for you by one of the four owners who are more than eager to chat about what’s in their Superfood Saison (blackberries, goji berries, acai & pitaya) or what hops are in their IPA Del Rey (Citra and Equinox). So after chatting with the owners, sitting in one of their futons, sipping their beer and hanging out in their space you’ll begin to fully understand Indie Brewing Company and all that goes into craft beer. Your only chance to visit their taproom is on Friday evenings from 5-10pm, but that will change to more regular brewery hours once they get a few details ironed out. Keep watch on our website for Indie to start being featured on our East & Central LA brewery tour or on any of our private tours. We’ve had two breweries in Glendale for a while now: Golden Road and Eagle Rock Brewery… or so we thought. In reality, Golden Road is in Los Angeles and Eagle Rock Brewery is in Glassel Park, they’ve only been in the Glendale of our minds. However, the barley gods have given us a new brewery that is in both the Glendale of our minds and our maps. Brewyard Beer Company – 906 Western Ave, Glendale, CA 91201. The homebrew duo Sherwin Antonio and Kirk Nishikawa just opened a 4,500 square foot facility in Glendale and will start seving beer to the public this month. They’re slated to start serving up four flagship beers: California Common Lager (Steam Beer), Passion Fruit Saison, Schwarzbier & an IPL (India Pale Lager). Which all sound like great additions to the growing roster of flagship beers available in Los Angeles. With hours similar to that of the Eagle Rock Brewery taproom, they’ll be open Wednesday to Sunday with opening and closing varying each day. And within a short time they’ll be a welcome addition to our East & Central tour, along with other (soon-to-be) newcomers like Arts District Brewing, Iron Triangle Brewing and Boomtown Brewery. We’ll keep you posted on the development of that. Well, it’s happened. Golden Road Brewery has now become, “Golden Road, a wholly owned property of ‘Craft’, the operating subsidiary of Anheuser-Busch, a global conglomerate partnership with Inbev” or some other junk like that. Golden Road sold out and now they’re not ours anymore. It was announced this morning that Golden Road would be bought by ABI. No details were made about the purchase price (hopefully they will emerge somewhere). Their immediate plans are to operate as planned, which includes opening a facility in Anaheim and a tasting room in Grand Central Station in DTLA. Co-Founder Tony Yanow made a mention on his Facebook page that he’ll be stepping aside to let Co-Founder Meg Gill run the operations with ABI. Yanow will shift his focus to his own craft beer bars (will they still be craft beer bars if they’re pouring a bunch of GRB?) Tony’s Darts Away and Mohawk Bend. What does that mean for us? Will we still bring tours there? Will we still sing the praises of how Golden Road is constantly improving and being an advocate for our fledgling brewery scene in Los Angeles? The last time this happened was with the purchase of Angel City Brewery by Boston Beer Company. And what we learned from that experience is that it doesn’t matter who owns the brewery. What matters is how the owners treat their beer, their customers and the community. Our team and our customers were treated poorly by the management at Angel City and as a result, we don’t take tours there anymore. Currently, they are the only brewery in LA that we don’t visit. Our relationship with Golden Road has been an excellent one up to this point. Our customers enjoy their beers, their mangement team and bartenders are wonderful to work with, and their tasting room is a delight. If any of that changes, we will reevaluate our relationship with them, but I imagine it will take quite some time for any of that to change. What will happen for us is that we will be very clear to our customers about the ownership of Golden Road and we will be tasting their beer very carefully, keeping our fingers crossed for improvements. Check their Facebook Page for updates on more participating breweries. You can bet you’ll see our buses at Three Weavers, Sunset Beer Co, Eagle Rock and Golden Road. All you have to do is go to any of those breweries on Saturday, May 9th and drink. If you don’t want to do that (which is crazy) you can just go directly to their website and donate there. They will be donating the money to GlobalGiving and here’s their link. Looking for handmade beer in LA? There’s a new player in South El Monte that not only hand makes delicious craft beer, but hand makes the equipment too: Progress Brewing. As a quick side note, Progress opened their brewery a few months ago under the name “Federal Brewing” but because of its shared name with “The Federal Bar” of North Hollywood and Long Beach, they were forced to change it to “Progress”. I’m a fan of the new name. It has a nice ring to it and there isn’t any more explanation that “it’s not that bar in downtown Long Beach”. Started by Diego Benitez and Kevin Ogilby, Progress Brewing is South El Monte’s first brewery and currently its only brewery and the greeting on the wall outside this industrial space is just as friendly and welcome as the beers and people inside of it. Cindy and I made our way over to their taproom last week (after a quick pitstop at the newly opened Jimmy John’s in Pasadena, which, if you’re a Midwesterner like I am, is big news). The Progress taproom sits proudly on a corner space in a heavy industrial area sandwiched between the 10 and the 60 Freeways just West of the 605. A quick trip around the block confirms that the signless building on the corner is in fact a brewery. Parking is ample and the entrance into the taproom is located on the other side the building from the “Cerveza / Craft Beer” painting (seen above). Once inside, you’ll find that the guys at Progress have been busy. At the time we went, they had 7 beers on tap, had just blown through the last of another beer, and were preparing to tap a new red ale. They’ve also been busy slanging beers. We were there at 3:30pm on a Monday afternoon (cause that’s what you do when you drive a beer bus all weekend). The entire bar was full and there was a constant stream of people coming in to fill their growlers. It seems like the people of South El Monte have found a home in this brewery. The beers were solid with a lot of promise for the future. The Bronco, a belgian pale, has been one of their best sellers and I can easily see why because of it’s incredible drinkability with a distinctive belgian flare. It will be exciting to see their beer list grow and even more exciting to see how they will grow their brewery given that all of their equipment is handmade. A lot can happen between Thursday and Saturday… Friday. Our new $50 Friday Night Beer Hop has all of the same beer of our Sunday tours but with all of the fun of falling on Pay Day. Good Question. We meet you at a given location and head off for 3 different craft breweries where you will meet people, talk beer, and drink delicious craft beer. Even better question. A brewery walkthrough of at least one of the locations, bottled water, personal beer guide, and a flight of fresh beer at each location. Why shouldn’t I do this? There is no earthly reason not to grab a few buddies and come out on a Friday night to enjoy craft beer and some new people. Why is it less expensive? Why are you worrying about that? It’s less expensive than our other tours because it is – simple as that. Any questions? Email us at contact@labeerhop.com or give us a call at 323-928-2113. Don’t act like you’re not impressed. We’re doing a Ron Burgundy tour this Saturday night and it’s taking you to pleasure town. Sponsored by Anchorman 2: The Legend Continues and Paramount Pictures, we’re going to have a hell of a night this Saturday on our East & Central Public Tour. If you come join the tour you’ll get free t-shirts, mustaches, posters and a whole lot of beer tasters. We will be going to Angel City, Eagle Rock Brewery and Golden Road Brewery. The tour includes visits to those three locations, a brewery walkthrough, and all beer tasters. Pickup will be at Union Station in Downtown Los Angeles at 7:00pm. On top of all of that we will be giving two lucky guests VIP Tickets to an early screening of the film! So hop on down to the Pants Store, slap on your finest suit, and kick the vermouth to the side with a bair of steel-toed boots cause it’s gonna be a big night. Great, just what Los Feliz needs. Another hip foodie joint with a craft beer list. Seriously, it’s just what Los Feliz needs, wants and will adore. Spitz, a street food restaurant with locations in Eagle Rock and Downtown, just opened a new location in Los Feliz on Hillhurst just south of Franklin. It offers the same eats as its other locations, and while the Eagle Rock location is yet to own a beer list, the Los Feliz follows in the drunken footsteps of its Downtown brother offering a deep, excellent beer list. At the time I visited I was presented with a well organized and varied brew menu with many local options. What are you going to get when you go to Spitz? Well, you’re in for a full menu of street food specialties that you would typically only order when you are already drunk. But at Spitz, you eat the gut busting greek options first, then proceed to get drunk. The menu presents you with 3 options: a selection of meats – meat/lamb, chicken, falafel or veggie; Sandwich or Wrap; and a wide variety of topping options from “street food style” to “Zesty”. Finish off your evening with their great beer (draft, canned and speciality bottles) and wine list while sitting at the open window-wall or playing at their shuffleboard table. This morning, the website SuperOfficialNews.com posted a story that sent tingles through every party-goers spine in America. Bill Murray is going on tour. Not a comedy tour, not a musical tour. A party tour. Bill Murray is famous for many things, including crashing parties. Not hollywood parties. Your party. He’s also famous for a series of urban legends called “No One Will Ever Believe You”. You should look into that. Today, it was announced that he is going on a formal party tour of the country. Dropping in on anyone who invites him, given that they meet a few stipulations. The party should probably include drinking and karaoke, and you must have a sign that says “Bill Murray Can Crash Here”. If your party fits those guidelines, the website has given a 24-Hour Bill Murray Party hotline that you can call to register your party. Now, I understand that this is coming from a comedy news site, and the number they list is to the Westboro Baptist Church (famous for “hating fags”). That being said, I am not one to let an opportunity like this go by the wayside. I am formally announcing a special tour for Monday, August 6, the day that Mr. Murray (aka Kaiser Soze) will be in Los Angeles according to his calendar. We will be doing a tour of Central Los Angeles, stopping at 3 locations, and ending at a Karaoke Bar. Details, of course are yet to be hammered out, and Mr. Murray’s attendance is questionable, but we will have a banner on the side of the bus that reads “Bill Murray Can Crash Here”, so he will at least know. Half of the proceeds will be donated to Saint Vincent’s Healthcare, a charity supported Bill Murray. More details and confirmation to come.